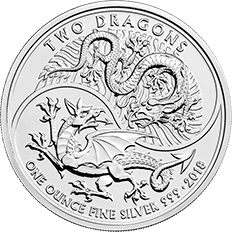 For 2018, we are excited to reveal a silver bullion coin featuring two dragons side by side. Struck in Wales, the home of the red dragon, and inspired by China, this silver 1 oz coin represents a unique collaboration of cultures and a new investment opportunity from The Royal Mint. The Two Dragons silver bullion coin is struck in 999 fine silver. The silver bullion coin benefits from capital gains tax exemption for UK individuals.